Located in Kilim area and only 10 minutes drive from Kuah Town, the Langkawi Wildlife Park covers an area of 5.5 acres of land area. Inside, the park has created an ambience of a tropical rainforest. It opened to public in November 2002 when it was known as 'Langkai Bird Paradise'. Initially it featured mainly aviaries with different species of birds. However, with addition of many mammals, reptiles and other exhibits, it has renamed itself to Langkawi Wildlife Park. You will now find over 150 different species of animals and birds from different parts of the world including South East Asia, Africa, South America, Australia, Russia and of course from Malaysia. However do not expect the large exotic species like the tigers or leopards here. The Langkawi Wildlife Park predominantly keeps the species which are not difficult to maintain. You will however find many funny and amazing creatures here. (1) It is a fully covered wildlife park and the first such park in Asia. It has roofed and covered walkways all the way from the entry to exit so that be it rain or shine, you can always enjoy the park and its exhibits. (2) Close interaction with the birds and animals. There are feeding sessions with various animals and birds. The visitors can actually hand feed most of the birds and animals here. Although the park may appear like a zoo to some, this activity makes the entire journey quite exciting to the children and families. You can buy assorted food bags at a small price (RM6 per bag) that contains food for animals and birds. There are boards next to each exhibit clearly stating what food is allowed for a bird or an animal. Once you buy the ticket and get through the entrance, you will come across one of several internal guides who we found to be quite friendly and knowledgeable. They can guide you as long as you want and be with you. There is no separate charge. In fact they will also let you know about each exhibit, their behavior, feeding habits and lot more so that the entire tour can become quite interesting. You can ask them any number of questions you want. The first section is Macaws (Blue & Yellow Macaw and Palm Cockatoos) followed by Flamingos. The Macaws love to feed on sunflower seeds and peanuts while the Flamingos like fish pellets. Next you will pass through a pond where you will find mandarin ducks playing around. You can feed them as well. You will then pass by the Crocodile and the Pheasants sections. The crocodile enclosure having salt water crocodiles is relatively small. Out of the pheasant species of birds you will see silver and yellow pheasants, peacocks etc. You will be amazed how even peacocks take seeds directly from your palm without hurting you. After that you will walk by the side of a beautiful orchid garden full of white and other colorful orchids. 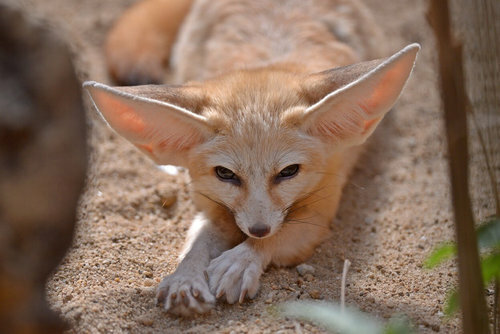 You will then come to the Mammals section where you will see several different types of small animals including bear cats, rabbits, raccoons, guinea pigs etc. 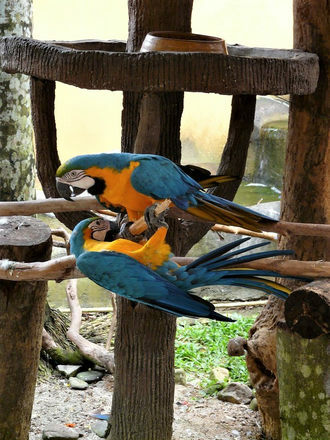 Next is the main attraction of Langkawi Wildlife park, The Walk-in Aviary. 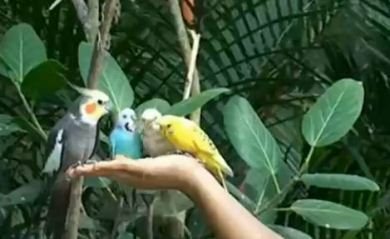 There are lots of small colorful 'Love Birds' (also known as Budgerigars) who are freely flying around. Hold out some mullet seeds and they will come and sit right on your hand and feed directly from your palm. Don't be surprised if you find five of them sitting on your hand at a time, they are simply fearless. 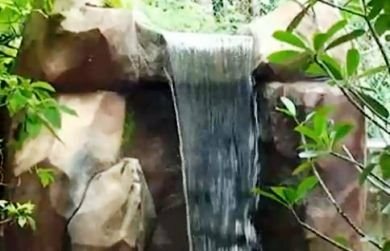 There is a 15-foot manmade waterfalls next to the aviary. You will also find a section for mouse-deer which too you can hand feed. After the Aviary Section you will walk through the Crystal Gallery. This is an outlet that sells fine crafted crystals and jewelry from China and Brazil. In the following sections you can experience porcupine feeding, ostrich feeding, arapaima feeding, monkeys feeding etc. It's quite an experience as you see an ostrich snapping away the food from your fingers. In the Birds of Prey section you will find birds like the vultures from South Africa, Brahminy Kites from South East Asia and the White Bellied Sea Eagles from Kilim Geopark. If you are brave enough, you can let an eagle perch on your hand. They will provide you gloves. If you carry your camera, you can keep taking pictures or ask the guide to take your picture with animals and birds in the background. There are also professional photo corners where they can take your picture while in interaction with select set of animals or reptiles like snakes etc. These are of course chargeable. The tour ends at the shopping outlets where duty free shopping is also available. Some animals and birds can be fed only at specific times and not all through the day. Also there is an Animal Talk Show that takes place at specific times of the day. Note the following schedules so that you can time your visit depending on your interest. NOTE: You will need to purchase feeding fun food from a stall near the entrance if you plan to feed the animals and birds. There is an on-site restaurant called Brahminy Kite Cafe that serves snacks and full meals. Some of the popular dishes here includes Nasi Lemak, Chicken Rice, Sandwich etc all of which come with fruits & coffee. Some of the shopping outlets in the complex includes The Zon Duty Free, Batik Shop, Wax Art, TTT Handicraft, Digi Photo, Crystal Gallery etc. You will find a shopping area about half way as you walk and again at the end. None of the shops would try hard selling, so you can simply look around and see if you find any gifts or souvenirs of interest at a reasonable price. You need to separately buy a food pack (RM6) if you want to feed the animals. You can take a private guide for RM20. There are family packages available too for entry. Note that tickets are sold up to 6pm. The park actually closes at 7:30pm. Langkawi Wildlife Park is located on Jalan Air Hangat near Kilim area. It is about 8.5kms from Kuah town (takes about 10 minutes by taxi). From the International Airport at Padang Matsirat, the distance is 30kms and takes about half an hour. If you take a taxi, then keep it waiting at the car park next to the entrance. You may not otherwise get a return taxi. There is ample car park available.